This week, we bring you the results of the 1st Annual Cruise Examiner YouTube Survey. 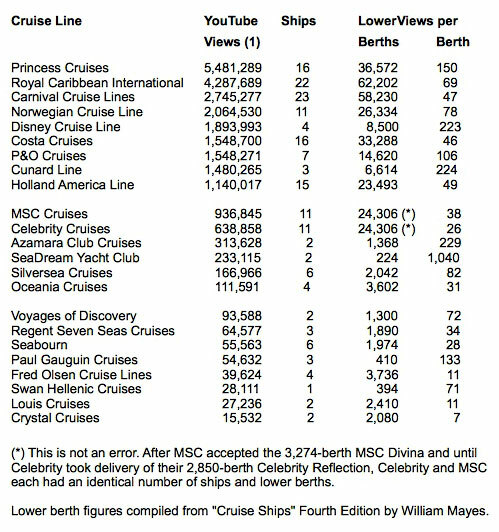 With most cruise lines now having YouTube accounts, we felt it was time to compare how they are doing. The big winner is SeaDream Yacht Club, who have scored a high of 1,040 YouTube views for every lower berth in their two-ship fleet. Other high performers include Azamara Club Cruises, with 229 views per berth, and Cunard and Disney, with 224 and 223 views, while at the bottom is Crystal Cruises with just seven. With the arrival of the powerless Carnival Triumph at Mobile last Thursday, we compare her situation to that of the Carnival Splendor just over two years ago. 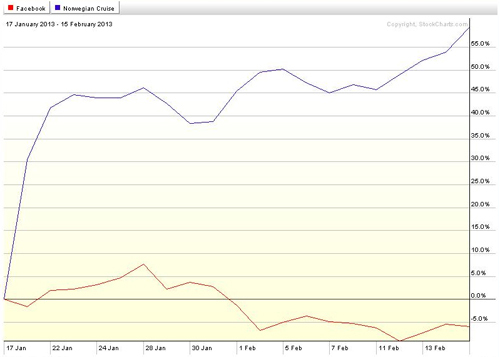 We also have up to date information on Cruise & Maritime Voyages’ Australian positioning voyages and look at how Facebook shares now compare to Norwegian Cruise Line shares since last week, when they were both at around $28. With most cruise lines now having dedicated YouTube accounts, we thought now was the time to see how they are doing. This is not to say that YouTube will bring bookings but once one has made a decision to seek out a cruise, videos can provide a significant source of information for some intending passengers. They have the clear advantage of being able to impart more of a feeling for a product than media such as Facebook or Twitter, for example. And they can bring to life cruise line websites, so many of which try to categorize and shape individuals. Indeed, some cruise line websites are so concerned with their own needs rather than those of the intending customer that they have become difficult to use. So who is the big winner in this year’s YouTube video stakes? Seeing as filling the beds in a cruise line’s ships is one of the standards by which success is measured, we decided to measure YouTube video views in terms of the number of views obtained per lower berth in their fleets. And the winner by far, punching way above its weight, is SeaDream Yacht Club, who up until Valentine’s Day, the date of our survey, had generated 1,040 views per berth. Runners up lag behind, but include another relative newcomer, Azamara Club Cruises, with 229 views per berth, and two big names, Cunard Line, whose ocean liners provide their back story, with 224 views per berth, and Disney, the big entertainment corporation, with 223. In terms of sheer volume, Princess Cruises’ almost 5.5 million views outstripped the much larger Royal Caribbean International, with 4.3 million, while third and fourth places went to Carnival Cruise Lines at 2.7 million and Norwegian Cruise Line, with almost 2.1 million views. Of the volume lines, Princess also scored highest with 150 views per berth compared to 78 for Norwegian, 69 for Royal Caribbean and only 47 for Carnival. Honorary mentions fall to Paul Gauguin Cruises, who achieved 133 views per berth and P&O Cruises, who achieved 106, which is a surprise as the UK-based operator managed to outperform all the American main market lines. 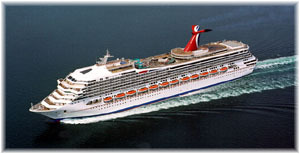 On November 8, 2010, the 2008-built 113,323-ton Carnival Splendor had an engine room fire off the west coast of Mexico, after which she lost power. In her case, the CO2 suppression system malfunctioned and it took three hours to quell the flames, during which time damage was caused to two engine control switchboard rooms directly above, melting electrical cabling in the area. Her diesel-electric propulsion means that six banks of diesel engines, three each in forward and aft engine rooms, propel the Splendor driving two electric motors that turn her twin screws. Diesel engine number five in the aft engine room had suffered a split in the crankcase and caught fire, causing the damage to the engine control rooms and cabling. After the fire, there was no electric power to the propeller shafts, no air conditioning, no hot water, no lighting, no refrigeration, no cooking, no drinking water treatment and the toilets were not functioning. Most of the ship’s communication was dead. The engine room crew were able to start up backup generators to provide limited emergency power supply. As the Splendor was registered in Panama the investigation was undertaken by the Panama Maritime Authority and it took three months in a San Francisco shipyard to get the ship back into service again. But the month after the fire, the US Coast Guard issued two marine safety alerts that reported discrepancies between the ship’s Fire Instruction Manual (FIM) and certain elements of the actual on board system, some of which (for example C02 valves) did not function. All 3,299 passengers and 1,167 crew members of the Carnival Splendor ended their voyage in San Diego on November 11, 2010, when six tug boats berthed her at 8:30 am local time. While it was absolutely unusual that in a ship where it was claimed to have 50% redundancy that both engine rooms and all power should be taken out by one event, we now have a second example of the same occurence, in another ship propelled by the same six diesel engines in two engine rooms running two electric motors that turn twin screws. On February 10, 2013, the 1999-built 101,509-ton Carnival Triumph, second ship in the original “Destiny” class, suffered a fire in her aft engine room off the east coast of Mexico. Although the fire in this case was automatically extinguished, the Triumph also lost power and propulsion until an emergency generator could be brought into action. As with the Carnival Splendor, the ship remained adrift, in her case in the Gulf of Mexico, without most of her usual hotel functions such as air conditioning, and plumbing in the aft portion of the ship. All 3,143 passengers and 1,086 crew members ended their voyage in the Carnival Triumph in Mobile, Alabama, on February 14, when five tug boats berthed her at 9:20 pm local time. Almost three months worth of voyages have been cancelled toallow for the ship to be repaired. The US National Transportation Safety Board and US Coast Guard will be involved in the investigation, but as this ship is registered in Nassau, jurisdiction falls to the Bahamas Maritime Authority. In the case of each ship, well over 4,000 people, more than 3,000 passengers and 1,000 crew, had been left adrift without power and without hotel services for three or four days. The question is how two ships that have two engine rooms each and are supposed to have 50% redundancies ended up in this situation twice in the past 28 months. The result of the Carnival Triumph inquiry will make interesting reading, especially as a ship caught in rough seas far from shore would be in entirely different circumstances. In fact, the 2013 southbound voyage will leave Rome (Civitavecchia) on November 5, but the route will be via the Suez Canal. She will, however, make her southbound voyages via South Africa in 2014 and 2015. All three northbound voyages will take the South African route. This year’s 36-day southbound voyage sees the Astor leave Rome on November 5, 2013, via Leghorn, Malta, Port Said, Safaga, Aqaba, Salalah, Colombo, Phuket, Singapore and Bali, to arrive at Fremantle on December 11. 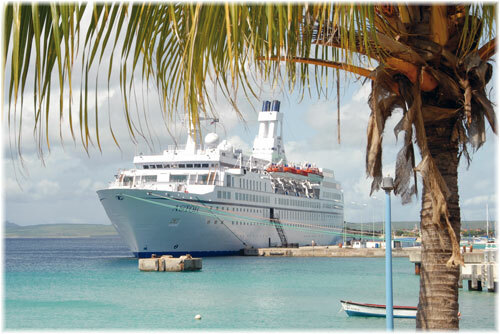 The 40-day northbound voyage will leave Fremantle on April 1 via Mauritius, Réunion, Durban, Mossel Bay, Cape Town, Walvis Bay, St Helena, Ascension, Cape Verde, Tenerife, Lisbon and Le Havre, to arive at Harwich on May 11. The accompanying graph shows the appreciation or depreciation in the two share prices since Norwegian Cruise Line Holdings was listed on January 17.